It’s Grandma! Hide the Froot Loops. When I got out of the shower, there was a message from my mother. “Call me when you get a chance,” she said, serious-sounding. “I want to talk to you about something.” I felt a twinge of foreboding. So I did a bit more work before I called her back. Turns out, it was a trick. She simply wanted to call my attention to the front-page New York Times story on the dangers of food coloring. Clearly she knew if she mentioned that in the message, I’d never call her back. Now I was trapped. I had mentioned that my 3rd grader was not a great reader: she picked babyish books, often misread words, and worst of all, didn’t enjoy it. 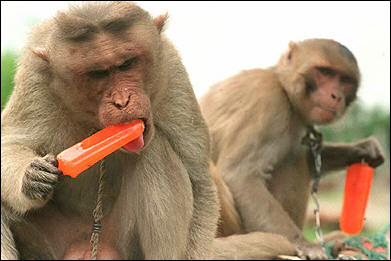 But my mother had the answer: too many popsicles! She reminded me that the last time she visited, her darling granddaughter had sucked down ice pops–before dinner–until her lips were blue. At the time, I waved off her concerns: just water and sugar, Mom. Well, clearly I had forgotten about the Green No. 3 and Yellow No. 6 dyes. And now here was the New York Times, validating what she’d long believed: food coloring makes children hyperactive! No wonder her granddaughter wasn’t reading Dostoevsky yet. This was big vindication for my mother, who didn’t buy junk food or soda when we were growing up. As a result, I guzzled Coke whenever I went to anyone else’s house, and once ate seven donuts in one sitting. It even vindicated her mother, who–as she reminded me on the phone–religiously checked ingredients and spurned anything artificial, putting her well ahead of her time. Mind you, this was a woman who could ruin a perfectly good homemade chocolate chip cookie with wheat germ and sunflower seeds. I have chosen to be a little more relaxed–some might call it lazy, or perhaps stupid–in monitoring what my children eat. When I go grocery shopping, for instance , I usually buy whatever they want–provided it’s written on the list–with a few arbitrary exceptions, like yogurt with little containers of M&Ms or sprinkles on top and neon-colored sugary cereal, except on their birthdays. Also, I personally do not believe that a cookie at 5:30 will “spoil your dinner.” As I see it, cravings for sweets exist in an entirely separate category from cravings for protein and vegetables, which even popsicle-addicts experience now and then. Eventually everyone has to figure out the whole food thing for themselves, so why not start sooner rather than later? OK, Mom, you win: I read the article, which is all you really wanted in the first place. But funnily enough, the piece I read found no conclusive evidence linking food coloring and behavior. This entry was posted in Cranky mommy blogger, Parenting, Reality check and tagged food coloring, hyperactivity, junk food. Bookmark the permalink. 2 Responses to It’s Grandma! 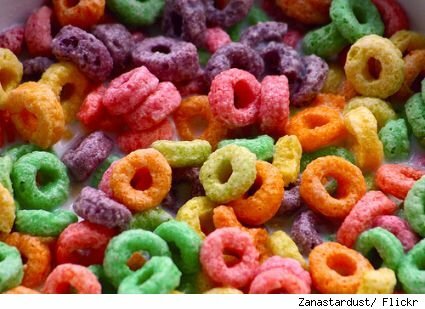 Hide the Froot Loops.